arcbox: INTERNATIONAL COMPETITION: NOW OPEN! African countries are facing an enormous challenge in the child development sphere: With over 140 million children scattered across Africa, the future of the continent is at stake. In addition, the international image of children is becoming increasingly homogeneous and based on a Western derivation of appearance and characteristics. Recent international and national development efforts in countries all over Africa have promoted children education and nutrition as the key to help communities overcome poverty, improve their lives and change their future. Mobilizing local governments to build safe, healthy, affordable and environmentally sound educational institutions for children and their communities, however, has proven difficult at best. Several research projects have found that integrated and well-coordinated Early Childhood Development (ECD) programs help countries maximize the effectiveness of their investments in children. Importantly, vulnerable children, their parents and legal guardians require well-integrated and coordinated ECD services to meet their needs. 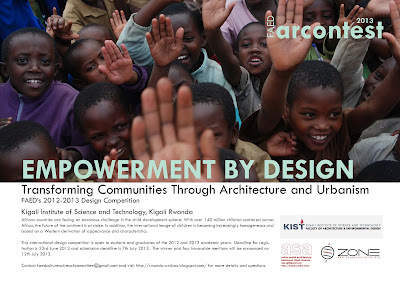 This international design competition is open to students and graduates of the 2012 and 2013 academic years. Deadline for registration is 23rd June 2013 and submission deadline is 7th July 2013. The winner and four honorable mentions will be announced on 12th July 2013. Contact faedcultureoutreachcommittee@gmail.com for the bases and more details or questions.